Oh Netflix, for $8 a month I can watch hours of online video in high-definition — sometimes streaming multiple movies to different devices in my home. I love you, but it’s clear my Internet Service Provider would rather see you throttled, or quite possibly set up a toll to make sure those precious bits you’re streaming don’t fall in cost too rapidly. Last October, Sandvine reported that 20 percent of the web’s traffic is generated by Netflix (s nflx). That’s just the tip of the iceberg; ISPs are faced with the possibility that online video streaming subscribers will only continue to grow and consume ever-more ’90s sitcoms or indie documentaries. Culturally this is dire, and yesterday, Mu Dynamics, a company which aims to provide some tools to help ISPs anticipate how specific applications will affect their network at scale, released data showing the Netflix threat is so much worse. 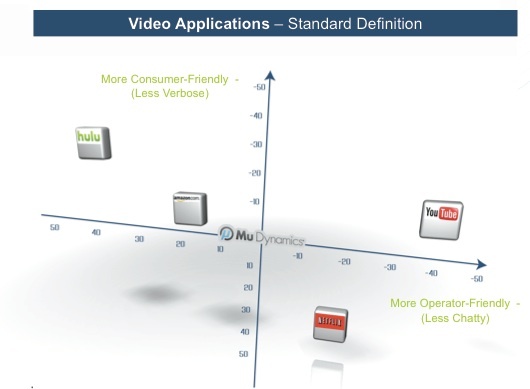 Mu measured Hulu, YouTube (s goog), Amazon (s amzn) and Netflix based on how many bits each service delivers and by how many connections back to their home servers the services required, and created a chart which shows Netflix may not be in the axis of evil, but it’s certainly in the wrong quadrant. However, to be fair, these are only for the high-definition versions of each service. When viewing standard-def video, the positions shift a bit, although Netflix is still delivering a ton of bits per second. That keeps it from being consumer-friendly, although it does shift to a more favorable position for operators, who have fewer connections to fret over. Mu provides an intriguing service with its technology, which can look at an application like Angry Birds and extrapolate how a sudden adoption of that app might muddle the network. However, it misses a huge point in its analysis by naming Netflix bad for consumers as ISPs begin implementing broadband caps. This isn’t a problem created by Netflix or any of these video services, but by ISPs themselves. In fact, Netflix recently decreased the quality of its streams in Canada to help consumers affected by bandwidth caps. Frankly, the hubbub and attacks around Netflix are getting tired. Years ago, Google was the favored Internet devil, and then P2P file sharing bore the brunt of the vitriol. But now that P2P usage has waned and Google is a huge company and somewhat willing to play the ISP game, it’s time to find a new scapegoat for why the telecommunications industry needs to institute caps and tiered pricing on wireline networks (wireless is different). Netflix is that scapegoat, and today’s “data” from Mu provides an easy visual for ISPs to flash around in their quest to demonize Netflix. You are trying to imply that ISP concerns are groundless and they tend to change their mind about who is to blame for their problems. Well, the engineering reality is that Internet was not designed for massive data traffic. The problem, as Berners-Lee saw it, was that the growth was vastly outpacing the capabilities of the Internet’s infrastructure which is the reason company like Akamai started their business. It was all manageable so far as statistical gain was working its magic with traditional web surfing. ISP could provision multiple customers on a single port and still provide great service to their customers. With P2P, not only people would keep their connection running full speed 24/7 but it also increased the problem due to the asymmetry of DSL (Most people using DSL) as there was more download capacity available then upload capacity, it would make the problem even bigger. With the improvement in Access technologies (ASDL2+, FTTx, DOCSIS…) real time streaming became widely available on the Internet and took away traffic from P2P (why wait few minutes, hours to download a movie when you can instant play it through streaming technology). As a result, Real-Time traffic is taking over P2P. ISP are not changing their mind about who is stressing their network they report the reality of the moment. The real issue which you completely forgot in your article, is the Internet ecosystem business model. Netflix pays a CDN provider (Limelight or Level 3) to make their content available to their end users (regardless of their ISP). What the CDN does is take the money and throw the traffic over the fence to the ISP who is not getting pay any additinal $ for that extra traffic. So you got a company (CDN) which is paid on a $ per GB basis when the ISP is paid on $ per subscriber basis. This is all good when the traffic is growing at a reasonable pace but not when it is skyrocketing. The fact of the matter is that the Internet ecosystem needs to evolve in the same way that Transit provider had to change their business model because ISP started peering agreement, there is a need for a new model that distribute the cost & the revenues across the board so that investment are made to make the Internet better, faster for all of us. And to your point about google, content peering agreement with large content providers has only been a temporary fix and the google problem will certainly resurface sooner than you might think. Any streaming service, in this case we’re all using NetFlix as the example, is going to piss off any ISP, especially Comcast or Verizon who offer content (tv), make money from offering that content and have complete control over what is and is not offered. I am looking forward to hearing about the increased number of Comcast internet subscribers who will start to receive the “you are over the limit” letters/emails regarding what Comcast feels is acceptable bandwidth usage for average viewing habits in HD. And Brett Glass, owner of Laramie ISP is right – running an ISP is not cheap. I only say that as I did work for an ISP/CLEC and learned what needs to be in place to just stay operational. While the impact on the consumers might be the same, the impact on the network caused by these streaming service are pretty different. 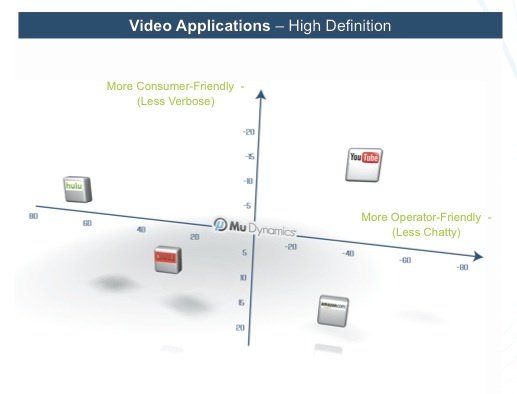 This was the point of the quadrant, to characterize these services both from the consumer and the network standpoint. You make some really interesting points â€“ thanks for the write-up. However, we want to be clear: weâ€™re not blaming Netflix. Weâ€™re not blaming anyone. Should service providers have broadband caps? Should consumers be able to use any and all video streaming services? Thatâ€™s not up to us. Whatâ€™s important from our perspective is everyone â€“ service providers and consumers alike â€“ having the data to make an intelligent decision. The consumers will vote with their dollars, the service providers will make decisions that best suit their networks and their business. Regardless of the outcome, we believe this information needs to be available for all involved. Before now, it was not possible to determine how these applications affected the network. With our new technology â€“ service providers and consumers can determine the impact of a particular app and decide for themselves how to move forward. Carolyn, are you from Mu? I assume yes. I am not trying to blame Mu, and think the technology you guys offer is interesting, which I did say. However, the problem, again not caused by Mu, is that ISPs aren’t operating in a competitive market in the U.S. and so even if consumers wanted to vote with their dollars they might not be able to. Plus in the Level 3 and Comcast dispute it looks like an ISP is trying to use its access to the consumer in order to raise prices on Netflix. From the point of view of a consumer who needs a high quality HD image, Netflix is exactly where I want them to be. *Of course* I want as much data as possible… I’m watching a 100″ projection screen. The more the streams are compressed, the more they degenerate into unwatchable crap. We pay ridiculous amounts to service providers like Cox… if I want to have an aesthetically pleasing experience watching one or two movies a week, I damn well deserve to get what I’m paying for. I don’t think it’s fair to say that Netflix recently decreased the quality of its streams in Canada. What Netflix did was add controls to let you adjust how much bandwidth you use. If you want no change, you get no change. Nice charts, but without labels on the axes, what do they MEAN? “Less Chatty” versus “Less Verbose”, measured in what, milli-angst-units? Anyone can draw an unsubstantiated ‘magic quadrant’ picture and call it ‘undeniable proof’ of something. Big woop. @paul see this blog: http://labs.mudynamics.com/2011/04/07/mommy-netflix-is-eating-my-firewall/ for more information on how we generated the data. @kowsik, thanks for the link, that makes everything much clearer (though the graph still needs some labels :). Have you guys been able to contact Netflix directly to see why they do what they do? @paul, top-posting since I don’t see a reply link to your last comment. No, we haven’t contacted Netflix, but my guess would be that they don’t really care about the impact of what they are doing to the network (in terms of connections and messages/second) as long as the end-user experiences the appropriate quality. It’s also possible that it’s the Silverlight plugin that does this rapid video-chunk GETs. Man, this issue causes me conflict. I love Netflix — in fact, I got rid of cable when we bought a Roku — but I also understand (as I’m sure Stacey does) the need to make some money, pay for infrastructure, etc. The question comes down to whether or not these ISPs are crying wolf, pleading desperate straits not because of actual congestion or costs, but because they want to protect outrageous margins and can do so because of a lack of competition. (Where I live, I can have Time Warner Cable or… smoke signals.) I don’t think any of this will be fixed until and unless we see major competitive development in broadband provision — hopefully from real innovation and not some kind of Telecom Act Part II. I don’t get it, why do US people take this BS? The prices are very high for broadband in the US, the speeds medium, and now the operators want to put caps on usage. Big GREEDY BIZ runs our free country! !